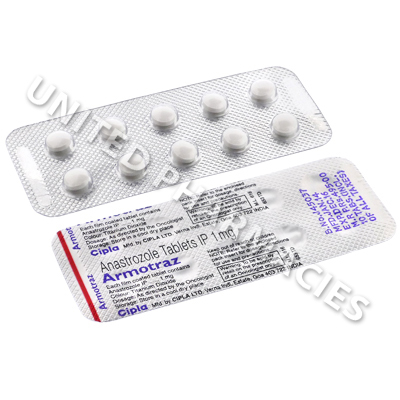 Armotraz (Anastrozole) belongs to a class of medicines referred to as non-steroidal aromatase inhibitors and it is indicated for the treatment of advanced breast cancer in postmenopausal women, post surgery breast cancer or else metastatic breast cancer. Treatment with this medicine is referred to as hormone therapy, as its method of action involves decreasing the body's production of oestrogen. Certain types of cancer (known as hormone receptive positive) grow by acting on the oestrogen receptors of the cancerous cells, allowing the cancer to spread. The production of oestrogen in postmenopausal women is due to the aromatase enzyme producing oestrogen from other hormones in the body. As this drug stops the aromatase enzyme from making oestrogen, a drop in oestrogen levels occurs, thereby denying the cancer cells the oestrogen needed to grow. Studies have been conducted which compared its efficacy as a first line treatment for advanced breast cancer to other medicines. Other analysis has taken place which focused on its use in combination with certain other medicines for the treatment of metastatic breast cancer. Some medical experts also believe that it is useful as an adjuvant treatment in patients affected by early stage breast cancer over an extended period of time. 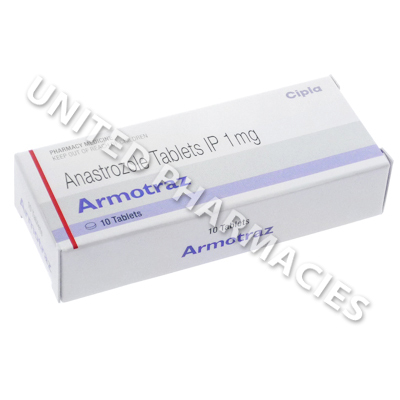 Armotraz (Anastrozole) is provided as 1mg tablets for oral administration. If this medicine is being used as a first line treatment for types of breast cancer which are responsive to treatment with this drug, it is possible that the doctor will direct the patient to take one table per day. Certain cases have required treatment for as long as 5 years. In all cases, it is essential that all instructions given by the doctor are strictly complied with. You are advised to notify your doctor of any bothersome side effects that occur during treatment. Although it is considered to be a less frequent occurrence, it is possible that serious side effects will occur in some patients who take this medicine. You must immediately seek medical attention if you experience noticeable changes in eyesight including blurring, blistering or ulceration of the skin, pain occurring when urinating or any other side effects which have not been listed here. This drug is not safe to use during pregnancy as it may cause serious damage to an unborn child. Vaginal bleeding can occur during the initial treatment period. If it is serious or persists beyond this, see your doctor immediately. Always use Armotraz (Anastrozole) as you have been prescribed by your doctor. Never self-medicate or change your dosage without first consulting your doctor. The correct dosage can vary depending on your health, medical history, and the severity of the condition being treated.